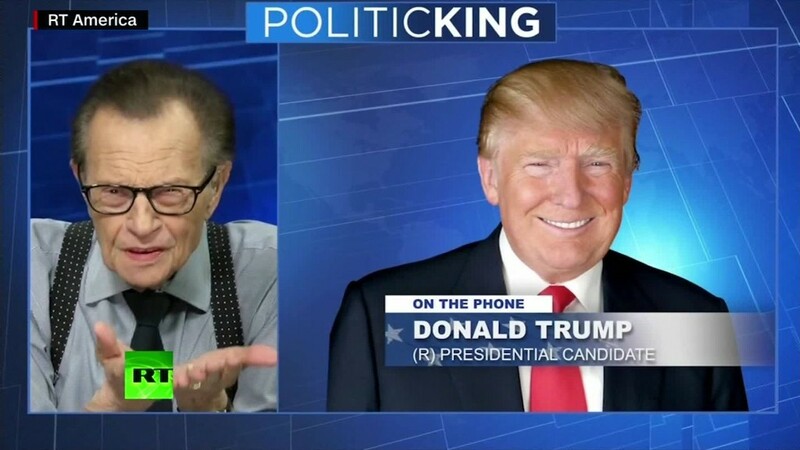 Donald Trump's campaign says Trump's interview with Larry King was recorded for a podcast, not for a TV program that aired on a Russian-owned network. King says that claim "stretches it a little." "I don't know what Trump knew. He couldn't have known it was a podcast, because he just did my podcast," King told CNN's Erin Burnett Friday night. The two men have known each other for decades. After Trump appeared on King's podcast, King repeatedly lobbied Trump for a TV interview, he told Burnett: "I've said, 'You gotta do my TV show,' he said, 'I'm working on it, I'm working on it.'" Ultimately the arrangements were made by King's producers and Trump's aides. "He was doing my TV show," King said. And that's what the ensuing controversy is all about. King's interview programs are produced by Ora, a media company owned by Mexican billionaire Carlos Slim. King owns a piece of the company. Ora sells King's programs to several distributors -- and the best known outlet is Russia Today, or RT for short. Russia's various versions of RT, including the English-language RT America channel in the United States, have carried King's interviews for about three years. King said he has complete independence. King's Trump interview was taped on Wednesday and shown on Thursday. It was instantly controversial because Trump's ties to Russia and favorable views of Vladimir Putin have been heavily scrutinized during the presidential race. RT's own web site covered the dust-up this way: "U.S. media, Trump's own campaign freak out about his interview on 'Kremlin RT.'" On Thursday night the campaign said Trump did the interview "as a favor to Mr. King" and believed it was for a podcast. On Friday morning campaign manager Kellyanne Conway said "Mr. Trump went on his podcast. Nobody said it would be on Russian TV." King's podcast and TV show are separate entities. Speaking with Burnett Friday night, King said the controversy is amusing and "a mountain out of a molehill." King, a veteran of CNN before partnering with Slim for Ora, defended his editorial independence: "I have never been told what to ask or not to ask." On his programs, he said, "Russia is criticized. Putin is annihilated. And they have never edited it." King said he has not heard from Trump since the interview. Burnett asked him about the strange way the interview ended -- after only ten minutes -- when King tried to ask Trump to describe his feelings about Mexican immigrants. Trump suddenly went silent. "I don't know what happened there, we did not lose the connection, so something happened," King said on the show. King said Trump's camp apologized to his producers after the interview for the abrupt ending. And "not only did they apologize, but they were planning to reschedule another appearance next week," he added.